By LUDWIG VON KOOPA - Plus a sample of their works. Last Friday, the official website for Super Smash Bros. For Wii U and 3DS updated with the full list of composers for the 3DS version. All in all, there are a whopping 40 musicians listed, the vast majority are from Nintendo or Bandai Namco. If you're a videogame music buff, you might happily recognize some of the names and their works. You might also realize that some of your favourite musicians (like Koji Kondo or David Wise) are not on the list. If you recall, over seven years ago Sakurai published a similar list for Super Smash Bros. Brawl's composers. That list had 38 people on it. Fret not! This is only for the 3DS version, which has a significantly less amount of songs in it because there are only two songs per stage in that version. The Wii U version will have much more, and therefore, more composers that are not part of the 3DS project. Also, these musicians definitely are more than capable and will make arrangements of songs that belong to franchises they have never worked on before. But for those working on the 3DS version, this article wants to make you feel more acquainted with these guys. Musicians also in the Brawl list will be underlined and one of their Brawl contributions will also be included. Music may or may not be spoilers. ...Oh, and all of these are embedded. So this may load very slowly for you. Apologies in advance. If you would like a hyperlinks-only version, click here. Last music update: September 11 2014. Hiroki Hashimoto (BANDAI NAMCO Studios Inc.) TANK! TANK! TANK! ...Sorry, I have no idea. See Yoshinoro Hirai. AKA I don't have a clue. Ludwig had fun compiling this list of great music together. He hopes you had fun listening to it too! 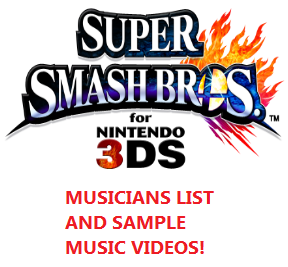 Share it with your friends who might doubt the Smash 4 3DS soundtrack, or who want to know about the musicians other than a list. If you have any corrections to make, do not hesitate to leave a comment! Ooh, lots of good names here! The games they did was off the Smash 4 site. The music they did was from research. I listened to a bit of Wild Arms 1's soundtrack today. Good stuff. *holds up Wild Arms 1 disk* You bet! Oh hey you got a disk.